If the Germans and Czech are famous for their beer, the Filipinos are known for Lambanog. Lambanog, also known as coconut wine or coconut vodka is a Filipino alcoholic beverage made from the sap of coconut flowers. It is famous for its high alcoholic content of 80 and 90 proof (40% and 45% pure alcohol). Take note, typically beers do not go beyond 12% or 14%! 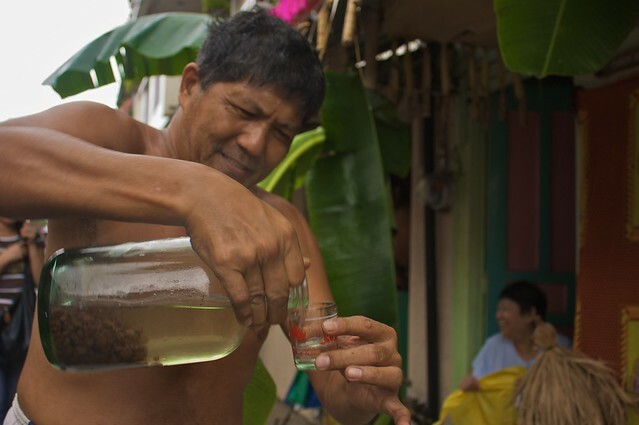 Lambanog used to be considered a poor man’s drink because its distillation process was inexpensive and quite easy to do. Plantation farmers would climb coconut trees to prune the coconut flowers. They would catch the sap from the flowers using bamboo receptacles or stalks and then would ferment it until it produces a kind of coconut toddy or liquor called tuba. Distilling the tuba would then result to Lambanog. Farmers would drink Lambanog to end their hard day’s work. Other times, farmers would sit in a circle and alternately drink shots from the same glass while others sing, tell stories, and play instruments. They referred to this communal activity as “tagayan” or wine drinking. No longer just a poor man’s drink, Lambanog is slowly evolving into a new alcoholic beverage as different flavours like mango, blueberry, cinnamon, and even coffee flavours are mixed with it.